Joe Mello attended the CWL last January and was awarded for his efforts, earning a contract with the Traverse City Beach Bums of the Frontier League. Mello is a 24-year old from Dublin, California and most recently played collegiate level baseball in 2015 at Lewis-Clark College in Lewiston, Idaho. Over three NCAA seasons, Joe recorded 3 saves in 16 innings pitched, sporting a 0.56 ERA and striking out 11 hitters. He also attended spring training with the Seattle Mariners in 2016 before finishing the season with the Pittsburg Diamonds of the Pacific Association. 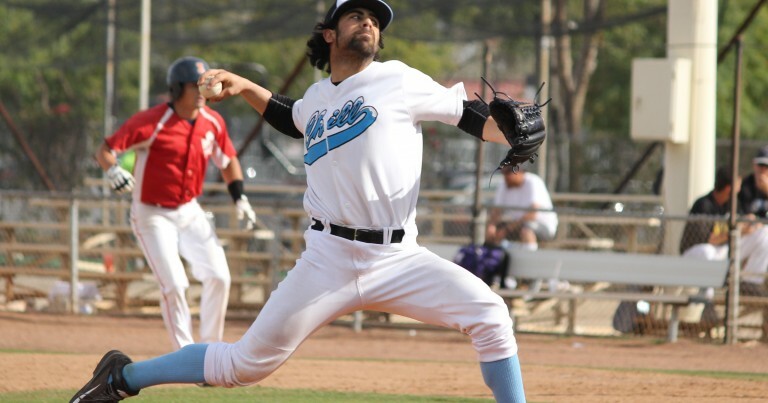 He came to the California Winter League in search of a contract to continue his career, and after appearing in 9 games with a 23/8 K/BB ratio in 15 innings with the Palm Springs Chill, was offered a contract with the Traverse City Beach Bums of the Frontier League for 2017. The 6’0″, 190-pound pitcher reported to Traverse City and appeared in 20 games, all in relief, striking out 22 hitters in 31 innings of work for the Beach Bums. The CWL congratulates Joe on all of his hard work and wishes him the best of luck on his endeavors!